Thanks to all of our competitors and volunteers who made Sunday 24 June 2018 a successful days racing, completing all of the remaining races from our February Spectacular. We are most grateful to the huge contingent from the Hawkins family who attended and were able to present the Fred Hawkins Memorial Trophy to Chris Hearn, our Champion of Champion for 2018. 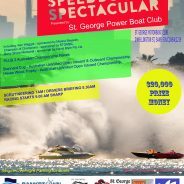 Unfortunately we were only able to complete the Saturday races for this year’s Speedboat Spectacular due to the strong winds and rain on Sunday. We hope to reschedule the races from the Sunday program to the weekend of 23rd & 24th June 2018. The races to be run will depend on the availability of boats. 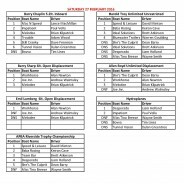 Results of the Spectacular races completed are below. The Annual Speedboat Spectacular is on this weekend and the weather is looking good. 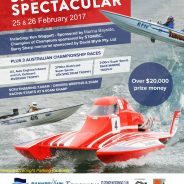 There are a number of interstate boats attending, including Liam Holland who is hoping to retain his Champion of Champions title. 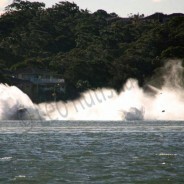 There are a couple of local F1 boats who are promising to give him a run for his money, including local Craig Bailey. There is a good collection of Hydro’s and blown 6 litre boats that will make the racing truly spectacular. Racing starts 9am each day. The 2017 Speedboat Spectacular has been postponed to the weekend of the 24 and 25 June 2017. 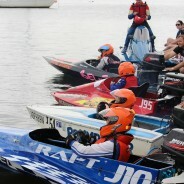 It is to be run in conjunction with the APBA Championship races planned for the spectacular and the final round of the NSW Formula Future Championships. A race program and further details will be available in the near future.